To figure out the tip amount, slide the star until it is where you would like it on the tip% bar. 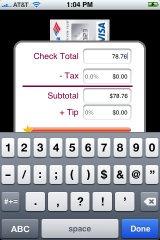 The tip percentage options range from 0% to 30%. 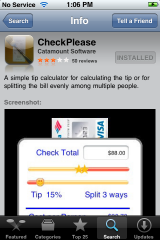 Once you have the tip% where you would like it, the application will automatically generate your Grand Total. 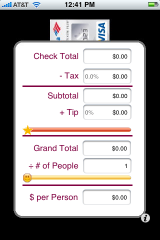 You can then choose how many people you would like to split the bill between by moving the smiley face along the bar. The bar starts at 1 and goes to 20. Once you are finished, how much each person owes is displayed at the bottom of the screen in the $ per Person option. You will also notice a i icon in the lower right corner of the app. 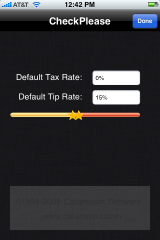 This will bring you to the Settings where you have the options to set a default Tax % and Tip Rate. I did take a few times using the app before I was totally comfortable with it. But, it does what it is supposed to do and it does it for free. I like this one, but I prefer the iSplit app….it actually lets you split the bill across 4 people and if one person didn’t have any of an item, they can be excluded from having to pay for it. Very nice…you should all check it out. I’ve used it several times. don’t see iSplit in the app store. Is this for jailbroken iPhone and on installer? perhaps they changed the name? Yes, the app store is getting tons of apps that do the same thing. especially free vs paid apps.